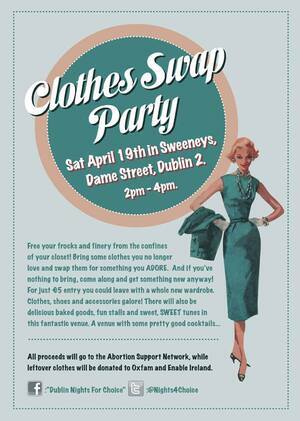 Swap your old clothes for some ‘pre-loved’ pants trousers, frocks and whatnot. Leaving all nether-garments saucily at the door. 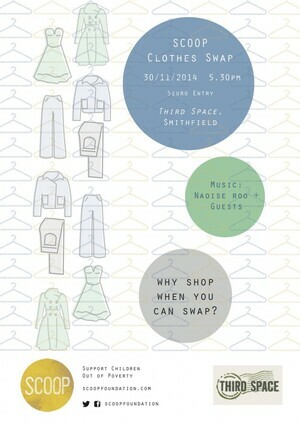 Hosted in Third Space, Smithfield Square, the event will begin at 17:30, this Sunday the 30th of November. We do ask that all clothes be clean and in good condition; no holes; bleach or paint marks etc. Oh, and of course, no underwear. A relaxed yet jovial atmosphere is to be expected & entertainment will be provided by local independent musicians Naoise Roo, Neev Kennedy and Conor O. The event pays homage to SCOOP’s mandate, of providing education for some of the globes poorest people – thus providing them with the tools to provide for themselves, rather than being forced to resort to default, by joining the under-paid workforce of a garment factory. A €5 donation at the door, will grant entrance into the event, while some light refreshments will also be available for purchase. Meanwhile, In Smithfield Where Were These When We Were Six? Meanwhile, In Smithfield Free On April 19? Posted in Misc and tagged Clothes Swap, scoop, Smithfield at 1:24 pm on November 25, 2014 by Broadsheet. Wait i don’t understand. We pay a fiver to work in a sweatshop?